Clean Koala 20” tyre set. Developed and used by Benito Ros, Ion Areitio and Sebas Ruiz. Exclusive Clean Koala soft compound, for high grip and stability. Clean Koala 20” front tyre. Developed and used by Benito Ros, Ion Areitio and Sebas Ruiz. Wider, more stable design, with larger knobs and foldable carcass. Clean Koala 19” rear tyre. Developed and used by Benito Ros, Ion Areitio and Sebas Ruiz. Exclusive Clean Koala soft compound, for high grip and stability. - Pair of Clean Koala 20” front and 19” rear tyres, supplied as a pair to replace both the front and rear tyres while saving some money. - Developed for months and currently used by Benito Ros, Ion Areitio and Sebas Ruiz, official riders of the Clean Trials team. 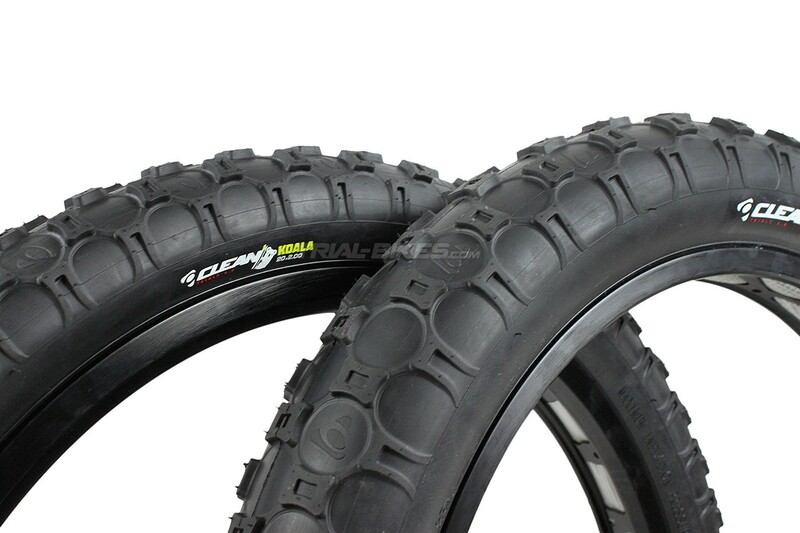 - Exclusive Clean Koala tread pattern, 100% bike trials specific, with minimized side knobs. - Designed with larger knobs, which help gain stability and obtain greater energy return. - Featuring a soft compound that allows for increased grip and stability on any terrain and weather conditions. - Foldable carcass in the front tyre and non-foldable in the rear tyre, with anti-puncture technology applied on both. - Note: supplied as a tyre set (1x 20” front tyre and 1x 19” rear tyre). - 1x Clean Koala 20” x 2.0” front tyre. - 1x Clean Koala 19” x 2.6” rear tyre. - Black, with Clean Koala white, yellow and red graphics.